For awhile I taught Sunday School in the early eighties. It was really just showing off not unlike Chaplin’s David and Goliath routine in The Pilgrim, but my father was there and enjoyed my declamations, so maybe it served some useful purpose beyond annoying other attendees. I was about as qualified to render Bible teachings then as Warners in 1954 when they brassily presented The Silver Chalice as spiritual balm for the devout. The Silver Chalice is anything but pious, which is why it works so well today. There’s more the peplum quality about it, a sort of biblical epic Sam Arkoff and Jim Nicholson might have scraped together had AIP possessed such resource so early (they were actually just getting started at the time). What I must know is this: Did ministers and associated clergy actually recommend this firago to parishioners? Did they condemn The Moon Is Blue and endorse this? The Silver Chalice was Christmas Day attraction in larger venues that year, where it doubtless answered prayers of those who attended perhaps in resigned anticipation of another Quo Vadis, with its suffering and ennobled Christians, but got instead an unapologetic trash wallow they’d not experience again until Hercules encountered those Captive Women. Warners tried dignifying proceedings. Their pressbook was actually bound in rice paper. 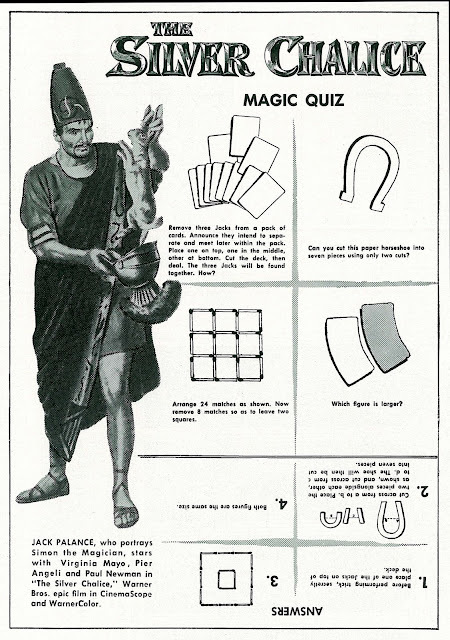 Ads boasted of a source novel that twenty-five million people had read (honest? --- has anyone picked it up lately?). 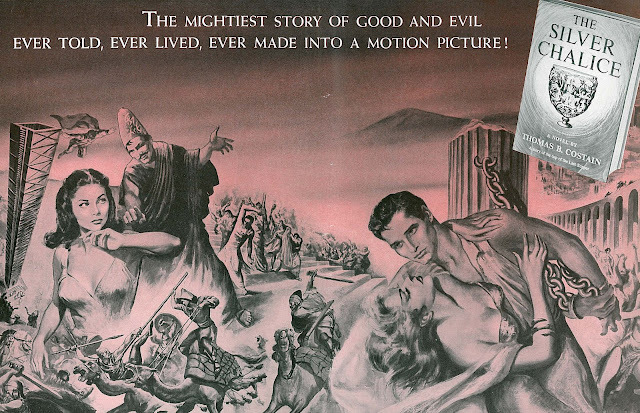 The Silver Chalice is a biblical movie non-believers can groove with, for it’s less about faith than magic, the latter supplied by Jack Palance’s masterly pulling of rabbits out of tattered cinematic hats. 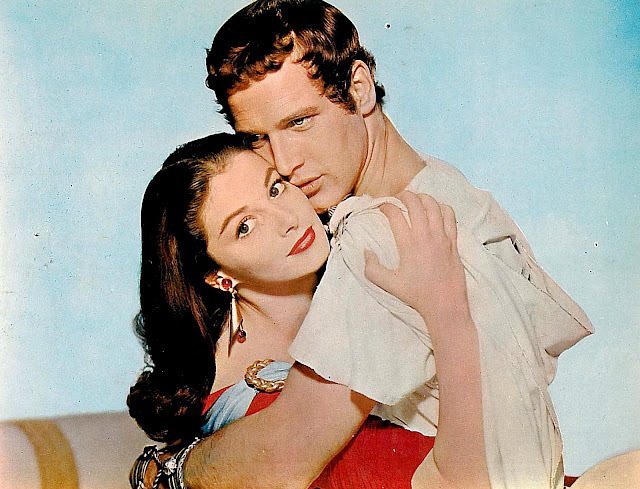 His kind of actor shrunk not from broad stroking and is a better reason for watching The Silver Chalice than nominal star Paul Newman, who began a career with this vivid recitation of what he could not do in films. Penance he’d make via a trade ad encouraging viewers to avoid a syndicated TV broadcast was maybe Newman’s idea, more likely a publicist’s. By the sixties and major stardom he’d consolidated, it was hip to renounce an out-of-dater playing scanned/mono/mutilated on Late Late Shows, though I’d have been busier apologizing for A New Kind Of Love and Lady L. The Silver Chalice is so bad it’s very good (Virginia Mayo should have gone on suspension rather than submitting to her eye make-up). Online reviewers point out sets that look like backgrounds in UPA cartoons, a point I’ll not address for never having been able to get through UPA cartoons. Some of what decorates The Silver Chalice actually reminded me of Fairbanks' The Thief Of Bagdad, though Warner economy here approaches outer limits of penury. They’d be damned missing out on righteous monies Fox had collected for David and Bathsheba and The Robe, but maybe it was divine retribution that robbed The Silver Chalice of profits at the end of the day. To that end, WB lost $350,000 against a negative cost of $3.2 million (domestic rentals were $2.2 million, with foreign an additional $1.5). We might actually be better off than most 1954-55 audiences for having a lush DVD adorned with stereo tracks of Franz Waxman’s lovely score (he’s reason enough to invest). So many exhibitors then opted for mono sound and wouldn’t bear expense of multi-speakers in cost burdened houses. 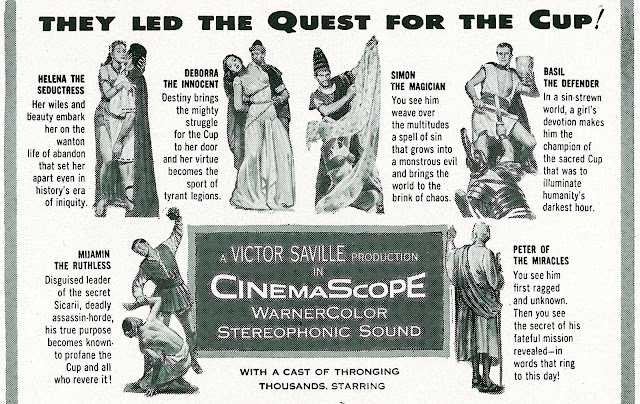 Outside of large markets, Cinemascope was at best a compromised experience and hardly suited to midget rural situations with screens limited by width of buildings housing them (like our Allen, which played The Silver Chalice as much on right and left walls as a crowded center). I’ll not take for granted how fortunate we are to have these early scope titles finally presentable. For all the years folks have laughed at The Silver Chalice in distorted hindsight, it’s finally possible to at last respect the many elements that are enjoyable and rewarding about it. I don't know if ministers encouraged their flock to see "The Silver Chalice" when first screened, but I must share this story about the bizarre Sellers/Starr film "The Magic Christian." When first released, our Lutheran minister took a bus full of church youth members (Luther Leaguers) up to Columbus to see it. Imagine their surprise! Actually, John, since you ask, I have picked up The Silver Chalice lately, and it's not bad as historical novels go. No, strike that, it's quite a bit better than not bad. Thomas B. Costain deserves rediscovery; a retired journalist who turned to novels at age 57, he was immensely popular up till his death in 1965, utterly forgotten today. Curious readers, though, might bypass Chalice in favor of, say, The Black Rose -- or better yet, his nonfiction four-volume history of Plantagenet England: The Conquering Family, The Magnificent Century, The Three Edwards and The Last Plantagenets. That tetralogy is a real pip; just open any volume at random and start reading. well." --Costain). Also those UPA-cartoon sets; they looked like something slapped together for a one-horse road company of Ben-Hur circa 1911. When I watched Silver Chalice as a kid I was really only interested in Palance, since he seemed to be the only interesting character, but I thought the sets were cool. If this had not been a Hollywood widescreen color spectacle on a bible theme, people would probably be calling those sets "expressionist." I'm not saying they are, just that people would say they are. I know this is a movie site, but I need to second Jim's recommendation of The Black Rose, a really entertaining, rip roaring tale. A really wasted opportunity when Fox filmed it in 1950 with Tyrone Power, Orson Welles and Jack Hawkins. It's a mere shadow of a wondeful book. I've always liked the movie of The Black Rose myself -- a Henry Hathaway picture would have to be a lot worse than that before I'd badmouth it. But Kevin does have a point: it is just a shadow of the book.